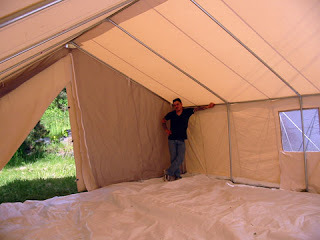 Since we're going to need a place to live while we're cutting down trees and building our cabin, we purchased a 16' x 20' wall tent. 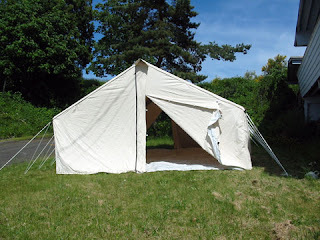 The tent is made of canvas treated to resist water, mildew and fire. Let me tell you, this sucker is h..e..a..v..y! 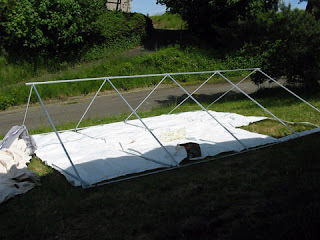 There are lighter options, ones with nylon side walls; but, since we'll have the tent stove burning inside and nylon tends to crack at sub-zero temps, we opted for all canvas even though it nearly rips our arms out of the sockets carrying it. We opted for an internal frame because we will be living in it long-term. We purchased a welded angle kit with the tent, and then purchased and cut down 1" aluminum electrical conduit to make the frame. Of course, cutting down the conduit is easier said that done. 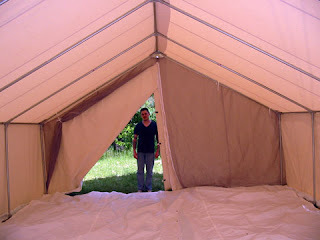 Firstly, the tent dimensions are for cut size, not sewn size and we didn't have any place quite big enough stretch the tent out flat enough to get completely accurate measurements... so we measured, did some math and then we guessed. Secondly, we forgot to take into account the additional lengths added by the angles themselves. We got the entire frame together, battled the canvas into place, only to find out that we needed to trim down the rafters, eaves and ridge because they were too long to actually pull the canvas across properly without putting too much stress on the seams. *SIGH* So much for geometry! We took everything apart again (incurring several minor injuries), trimmed 3" off the rafters and 1" off the eaves and ridge. We put the newly trimmed frame together again and wrestled the canvas back with only a mild concussion and one dislocated finger. After a few minutes of tugging and tweaking, everything settled nicely into place and there was much rejoicing. We rigged up the tension ropes and wet the whole thing down to pre-shrink the canvas. We'll have to wet it down and let it dry at least three times to make sure it has shrunk all it's going to shrink, since most treated canvas shrinks 1-3% (untreated canvas can shrink up to 15%). Let's just hope we don't need to cut the mother-loving frame down again or there will be much hatred. Once it's all put together, the tent is actually pretty cavernous. It could easily sleep 10 people in cots with plenty of walking room. Or, in our case, two adults, two cats, a queen-sized bed, a couple of dressers and everything we own stacked up in boxes. Well, at least until we get our "cache" built, and can move some the stuff into that while we're building the main cabin. 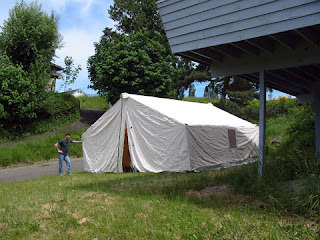 There is a rain fly that we'll be adding to the tent, which extends 5 feet on either end to form a "porch" of sorts. That covered area will come in handy for storing firewood and our privy bucket. We'll be erecting the tent on a raised platform on the property, so it will be even more stable, and we'll have a small deck to sit and enjoy the evenings. I don't think your crazy. id do it with two young kidos if I had the chance. lol to each there own. Wow, that's fantastic .Looking forward to doing the same one day when we build our house down here in Aus, we plan to build a solid tin roof with guttering over the tent roof so we can have solar & collect rain water for the tanks.All the best in building your dreams.